project 323Clean Water, hygiene education, and sanitation for two communities in Trojes, Honduras. The project began with a base line of both communities, socialization with community’s leaders and community members, and installation of a model latrine and filter. These activities were followed by hygiene educational workshops, filter operation and maintenance workshops and the delivery of filters and latrine materials. The initial response of both communities was overwhelming. The community members began helping the PWW staff by fixing the road and assisting with the transport of the latrine materials and filters to their homes and neighbors. Children attended workshops on personal hygiene, environmental hygiene, and hand washing. School teachers from both communities attended workshops on hand washing and hygiene education. Both communities were given anti -parasite medicine two months after the filters had been installed. Nurses from the Health Center in Trojes helped with the de-worming campaign. The final activity was the delivery of safe water storage containers for the beneficiaries of the filters. The installation of latrines and filters is completed in the communities of Brisas de Poteca and Nueva Victoria. 81 filters and latrines were installed between these two communities. In B risas de Poteca: 32 filters and in Nueva Victoria: 49 Filters and latrines. Schools in both communities received new latrines for the students. Now the children will not have to go to the neighbors’ house or to field. The final activity is the delivery of 81 safe water containers for the beneficiaries with filters. These children and families now have improved drinking water, and improved sanitation facilities. Despite bad road conditions due to the recent heavy rains, PWW staff members have continued their work and all families have participated. This past week they were able to install two latrines and three biosand filters in Brisas de Poteca and 10 biosand filters and 15 latrines in Nueva Victoria. In total 32 latrines and 28 biosand filters have been installed in Brisas de Poteca and 40 latrines and 32 biosand filters in Nueva Victoria The project is on time and it’s expected to finish at the end of June. After installing the filters each family received a refresher course in the use and maintenance of the filter. It was impressive to see how the kids reminded their parents about some of the basic steps of filter maintenance. Workshops, material delivery and road repairs! 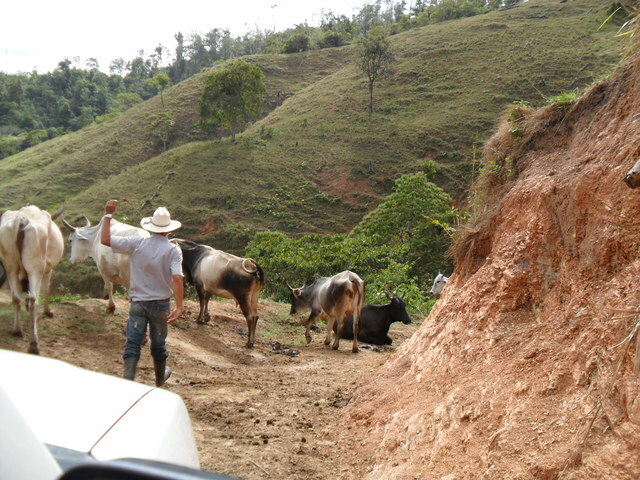 With the help of the Mayor of Trojes, the community of Brisas de Poteca was able to fix the road and the bridge to their community. Now the Pure Water truck can deliver the latrine materials and plastic biosand filters. They did a good job fixing the bridge, and both Pure Water and the community members are grateful! The staff began workshops on personal hygiene and sanitation in Nueva Victoria and Brisas de Poteca. In Brisas de Poteca, 17 women and 16 men participated in the hygiene workshop. Also, at the school workshops, 19 boys and 15 girls participated. Pure Water staff members have delivered 30 plastic biosand filters with all of the accessories and filtration material to Nueva Victoria. In both communities a model latrine was constructed so the beneficiaries could learn how to build a slab for their latrines. With this model and the supervision of the PWW staff they were able to build more latrines. As of this past week, they have built 16 latrines in Brisas de Poteca and 12 latrines in Nueva Victoria. Pure Water staff members are preparing a workshop for the community agents on filter installation, filter maintenance and the Community Agent Program. They are also preparing a workshop for the teachers on hand washing. in the communities took place. These took place at the local schools, and there was one socialization with adults and then another with Children. In Nueva Victoria a total of 101 people attended the socialization - 27 men, 29 women,19 girls and 26 boys were present. In Las Brisas de Poteca a total of 69 people attended the presentation- 20 men, 18 women,12 girls and 19 boys. The presentation consisted of a brief introduction of the project- how water is contaminated, ways to prevent water contamination, explanation of how the biosand filter works, plan activities with the communities, set up dates, and answer questions. In these meetings people showed their excitement about being benefited by this project. They signed an agreement of cooperation, where they agreed to help fix the road to improve the access to the community so the staff could enter the communities with materials without problems. They agreed to attend the trainings and to ensure that people will be ready in each family to assist with the latrine construction. The mayor of Las Brisas de Poteca also donated 20 bags of cement to fix a sewer under a bridge so we could pass to the community even when there is hard rain. In the begining of February, project staff members Renan and Ostilio visited the families in Nueva Victoria and Las Brisas de Poteca with the objective of updating the baseline from last year. The staff members were accompanied by one or two of the community leaders to interview each of the families. This way the families where convinced that the information they where providing once again was not going to be filed and forgotten. In the past, politians have used this information for their campaigns, promise projects and never return. 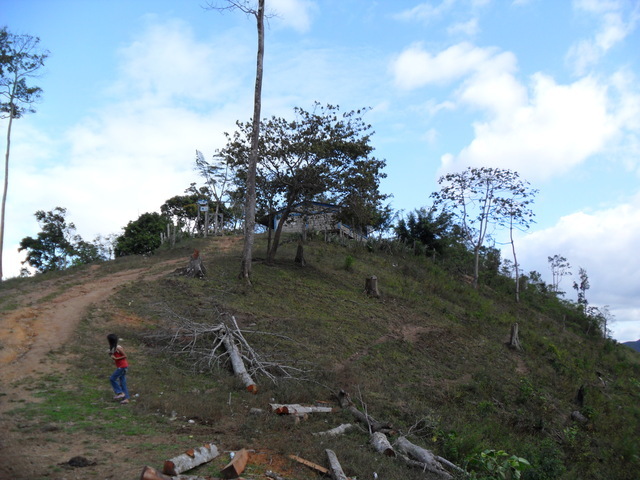 Surveys were part of the field work but office work consisted in updating and entering the information received from the families this year, in both Las Brisas de Poteca and Nueva Victoria, the final baseline information has been completed. Our goal is to use this to measure the impact and to share this information with the health centers and local municipality office. The base line survey helped us make decisions about the project. It also helped us update the number of families to be served. The original base line was obtained from the local health center and it had 46 houses in Brisas de Poteca and in reality there is only 37 homes. In conclusion the updated information is the following: Nueva Victoria has a population of 195 people, 45 homes. In Las Brisas de Poteca there is population of 210 people and 36 homes. Due to the conditions in these areas, PWW has had to change one of the communities which will benefit from this project. The community of Buenos Aires de Zepeda is close to a river known for major flooding. There was real concern, as the river was close to flood stage, that it would prohibit the project so another community was selected. Las Brisas de Poteca is already in the proposal, and after visiting a few other communities, it was decided that Nueva Victoria would be the replacement community. This community acknowledged the need for latrines and filters because their children have been suffering from diarrhea and other water related illnesses. I was among the group that recently visited Nueva Victoria and Las Brisas de Poteca. Both communities approached PWW as they understand the need for clean water and proper sanitation and hygiene habits. I was impressed that these communities had come to PWW and knew that the need existed and were prepared to assist in bringing about the necessary changes. The community members that we talked to seemed very excited about this project. The Pure Water program emphasizes education as a critical component of any water and sanitation project. This program provides sanitation infrastructure, hygiene and sanitation trainings, combined with the filtration units, to families and communities. A comprehensive education program is provided to the community and a hygiene curriculum is provided to teachers for use in the classroom. After the program has been installed, parasitic treatment is provided as well as follow-up monitoring. PWW has already planed post project visits to receive feedback from the beneficiaries on the use of the filter, the health of their community and individual families as well as to monitor water quality. These families received house to house training on the use of the bio-sand filter and the latrine. The latrine is designed so that when the first pit has reached the 2 year mark, the families have to stop using the first pit and use the second pit. This allows the first pit enough time to dry so the contents may be used as compost. The maintenance cost associated with this project comes from extra sand provided should they need to adjust the level of sand in the bio sand filters. During the last few months of the project it was very rainy, thus causing the road conditions to be terrible. However, it was amazing how the families got together and with their picks and shovels started to fix the dirt road so the road could be passable for the PWW vehicle. This allowed PWW to continue to deliver the bio-sand filters and latrine material, as well as continue implementation and educational trainings. Even during the rain the families and the staff would not stop their work. Even though it moved at a snail pace, it moved with the effort of all. PWW recognizes the need of returning to communities where the biosand filter projects have being implemented to monitor the project. This involves checking the compliance with filter and latrine use and maintenance. It also involves supporting the communities by holding refresher courses in the use and maintenance of the bio-sand filters, latrine maintenance, water disinfection, safe storage, personal hygiene and environmental sanitation. These families and schools also received hygiene educational training, hand washing clinics were hosted, and de worming medicine was distributed.